See for yourself. Our anemic economic performance since 2007 is . . . the best in the world? 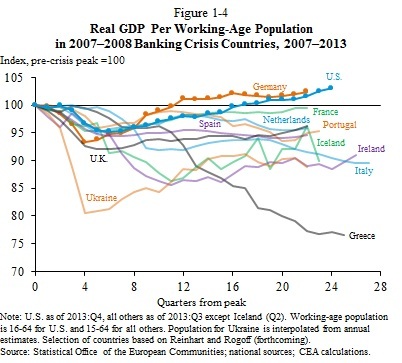 Yes, it’s still a slow recovery that has yet to restore full employment, but, except for Germany, we’ve done better than any of our counterparts in Europe that also experienced a financial crisis. I was going to say something about the folly of austerity policies (spending cuts and tax increases) during an economic slump, which is true insofar as US budget policy has been only mildly contractionary while our European counterparts have embraced austerity and all but one have sick economies to show for it, but that one is Germany, which was slightly ahead of the US as of 2013:Q2 (data for 2013:Q3 and Q4 were not available for the European countries). Germany’s economy defies easy explanation. Maybe Germany should be Luke Wilson’s character and the US can be Maya Rudolph’s. This entry was posted on 10 March 2014 at 9:51 pm and is filed under economic crisis, fiscal policy, international, recovery. You can follow any responses to this entry through the RSS 2.0 feed. You can leave a response, or trackback from your own site. “…our European counterparts have embraced austerity and all but one have sick economies to show for it, but that one is Germany.” That sure oversimplifies things to a great extent. Countries like Greece and Portugal weren’t “embracing” austerity as you claim, but were kicking and screaming as it was implemented, whereas Germany was actively encouraging it as a condition for EU financing to continue. The chart also assumes every country went through the same degree of financial issues at precisely the same quarter as the U.S. Perhaps the Luke Wilson you should compare is the Luke Wilson before and after time shifted.. Our approach now,is like being the smartest guy on in the remedial class. The recent U.S. growth is the worst in history: http://www.forbes.com/sites/realspin/2013/04/12/the-worst-four-years-of-gdp-growth-in-history-yes-we-should-be-worried/ The world has faced much more challenging financial issues than the Financial Crisis of 2007-8. Unfortunately, it doesn’t show austerity policies have hurt or helped those economies that implemented it as a result. It started in 2007? It’s ALL George Bush’s doing? He’s a economik jeenyus as well as a diplomat? Whodathunkit!? Oswego, NY and Spearfish, SD are two towns with between 10-20k people, have small thriving universities, a hospital, and summer tourism. Demographically, the populations are similar, with Spearfish being a bit younger. However, that’s where the parallels end. The unemployment rate in Spearfish, at just over 3%, is about a third of Oswego’s. School spending per capita in western SD is much lower than upstate NY, but school performance favors SD. There is a feeling of vibrancy in Spearfish; the town is growing, businesses are arriving and expanding, which is not found to the same degree in Oswego. SD, one of the most pro-business states in the U.S. has no state income tax; most local revenue is obtained from property taxes and sales taxes. Taxes are some of the lowest in the U.S.. NY, rated the least friendly state for business in the country, has some of the highest taxes, stifling laws on businesses that prevent job creation upstate, requiring a never-ending dependency on the city for financial transfers. It may make more sense to compare two cities with different economic approaches within the same country, as it controls for more variables than, say, comparing the U.S. economy with Ukraine’s. Spearfish, SD is not comparable to Oswego, NY on its face. It’s 2/3 the size, has a younger population and numerous other factors that would make it seem a great place to live. I’m thinking when you say, “business friendly” you mean non-union–only one of the major employers is represented by a union–the local school district. If you don’t like unions then it’s prolly heaven on earth. The “fact sheets” on a lot of the stuff they offer is more than a little sketchy and somewhat short on detail that would make a real comparison possible. Oswego, NY has approximately 4,600 students enrolled (source:http://www.newyorkschools.com/districts/oswego-city-school-district.html), Spearfish, SD, about 2,000. The Oswego School District’s budget is approximately SIX times the Spearfish School District’s. Is it bloated and full of “fat”. I’m sure it is if you’ve either got no kids or already sent them through the system. If you currently live in the city and send your children there for a largely free education? prolly not. Damned teachers’ unions. One thing that has been going up, of late, in Spearfish is the number of students who get subsidized lunches–at least until Paulie Wingnutz Ryan is able to get a bill through to law gutting THAT program. The county that Spearfish is in has about 120 employees and a budget of about $16M, roughly half of what the City of Spearfish has for a budget ($30M). The Oswego City Budget for 2013 was about $38M v the Oswego County budget of approximately $200M. Oswego Health is one of numerous hospitals and healthcare organization in the Greater Syracuse and Rochester area. It employs fewer people than the company that owns Spearfish Hospital it serves an area of several hundred square miles WHILE competing with numerous other hospitals for those healthcare dollars. “Founded in 1883, BHSU is South Dakota’s third-largest university with nearly 4,500 students.” (source:http://www.spearfishdevelopment.com/community-profile/education). So; there are similarities and a simplistic comparison of the two communities might lead one to the conclusion that west central SD is a better(where the value of “better” involves its cost per whatever) place to live than Oswego, NY. I grew up in Omaha, NE and a lot of the folks I grew up with left the city to get the life that they wanted–others stayed; cosmopolitan it wasn’t and still isn’t (although it’s become a much better place to live in a lot of ways). If hunting, fishing, hiking, skiing and other outdoor activities are what you hanker for–or the short commute to Sturgis for the annual Sturgis Rally–then I’m sure that Spearfish will fill the bill. If you want to be within a reasonable commuting radius for great restaurants, theater, pro sports, the arts and a lot of other stuff, well, I think that the winters are as long in Spearfish, albeit, sunnier, as they are in Owego. FWIW, I’m not from Oswego but I’ve lived here for about six and a half years and I know enough to not assume that barroom or political rally conversation is always in sync with reality. I’m not sure why that 19 day old comment is still sitting in moderation but that’s not why I’m commenting. Ranjit, I tried to send an e-mail to you and it bounced. I was curious if there was any data about what would happen to all of the urgent care and ER facilities if, all of a sudden, people didn’t HAVE to use them because they lack insurance. Interesting factoid about Luke Wilson and money.. He’s gone into partnership with Oxymoron Entertainment founder and Middle Men producer Christopher Mallick.. The very chap who swindled millions from unsuspecting users of his payment processor company, ePassporte.